A new photo has emerged from the Apollo 17 mission that conspiracy theorists claim prove that the moon landing was faked, but skeptics disagree. 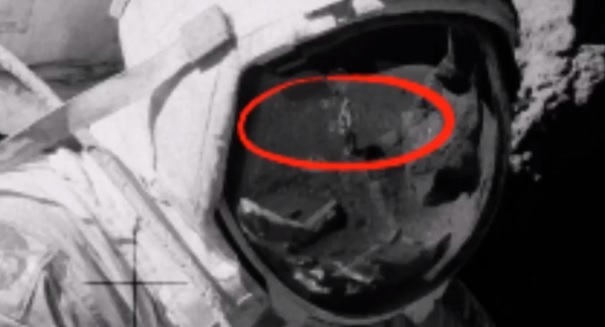 As we reported recently, conspiracy theorists who believe the moon landing was faked are in a frenzy over a new photo from the Apollo 17 mission that they say shows a man without a spacesuit reflected in an astronaut’s visor. But not surprisingly, skeptics are quickly throwing water on the outlandish theory. Conspiracy theorists believe that the moon landings never happened, and they were actually filmed in a studio so the United States could claim it beat the Russians in the Space Race during the 1960s and 1970s. However, skeptics note that the reflection in the visor could easily be a person in a space suit, or even a rock formation. Surprisingly, between 9 and 20 percent of the population doubt the moon landing in the United States, and the figures appear to be higher in Russia. There is not a single expert who believes that the moon landing was faked, however.